Did the Patriots make the right choice in letting Wes Welker go? Last March when New England refused to overpay Wes Welker he decided to sign with Denver instead, and the Patriots attempted to replace him with Danny Amendola. The average Pats fan was far from pleased with this. I wrote a piece trying to be optimistic about it, suggesting the theory that maybe the Brady/Belichick combination was a big part of what made Welker great. Over 6 seasons in New England Welker only missed 3 regular season games, while averaging 112 catches, 1,243 yards, 11 yards per catch, 80 yards per game, and 6.2 touchdowns per year. 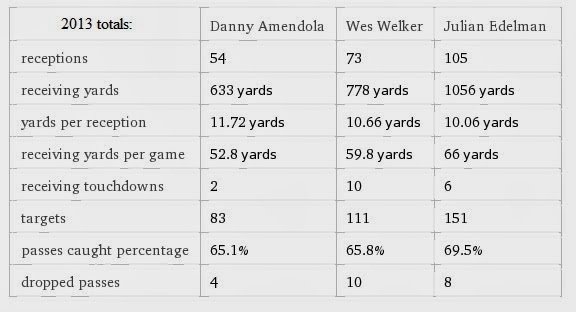 The thing nobody saw coming was the emergence of Julian Edelman, who's 2013 numbers blew both Welker's and Amedola's out of the water. Edelman played in all 16 games as well, and even if you project Welker's stats over a full season (90 catches, 957 yards) they still wouldn't have been as good. This definitely supports the notion that Tom Brady and the Patriots system has a lot to do with the success of these undersized slot receivers. Introducing the Boston Celtics "Tankometer"